What is the difference between albedo, absolute magnitude or aparent magnitude? What is the difference between albedo, absolute magnitude or aparent magnitude? I can’t really tell what’s the difference between them. Albedo is a measurement of reflected light. It varies between 0 and 1, with 0 being completely black (reflecting no light) and 1 being completely white (reflecting all light). The albedo of coal is about 0.04, which is actually very similar to the albedo of our moon. The Albedo of ice is about 0.7. Only planets and other small objects are described using Albedo because they cannot make their own light, and so its apparent brightness is due to reflecting sunlight. Absolute magnitude is a measure of how much light a star is emitting overall. Absolute magnitude is related to a bunch of other properties of the star, mainly how massive it is and at what stage of its lifetime it's in. Apparent magnitude can be used to describe both stars and planets. It is simply a measure of how bright the object appears to us. An illustrative example is Sirius and Canopus. Sirius is the brightest star in the sky, but it is bright because it is close, only being 8 light years away. Canopus is the second brightest star in the sky, and appears about half as bright as Sirius, but is about 300 light years away, which means the star itself must much brighter than Sirius. If we check the absolute magnitudes and do some maths (Sirius absolute magnitude = +1.42, Canopus = -5.71, the more negative the number the brighter the star, brightness difference = 2.5^(5.71+1.42)) we get a brightness difference of 680 times between Canopus and Sirius. Here is how I understand these terms. Apparent magnitude is what you can see, or measure from where you really are and where the object really is. 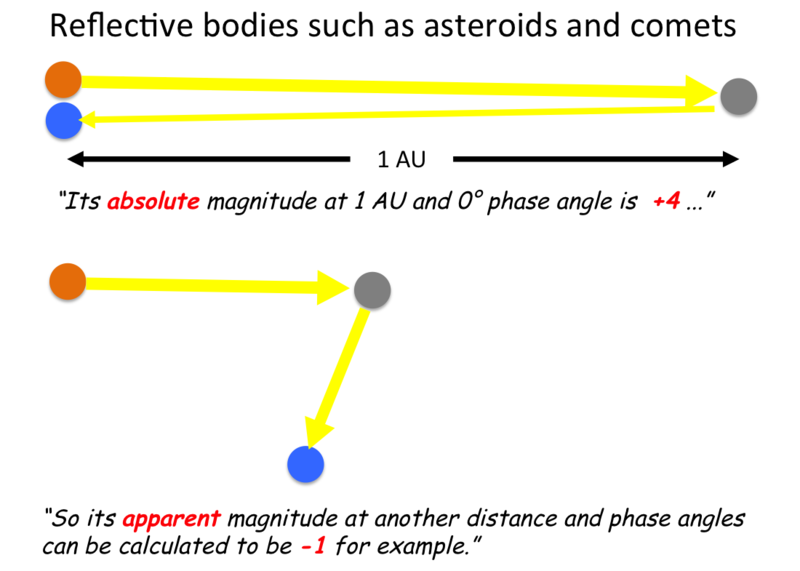 Absolute magnitude is a mathematical prediction based on a standardized distance and configuration (see below) so that you don't have to specify the particular conditions. Venus always has roughly the same absolute magnitude because it's always roughly the same size and albedo (see next), but varies greatly in apparent magnitude be cause of changes in distance and phase angle (sun-venus-earth angle). Albedo is a little tricky because different objects have different surface roughness and angular scattering properties. If it was a smooth ping-pong ball and had a well defined diffusivity profile, then it's easy to imagine a white, gray, or black ping-pong ball representing transitions from 1 to 0. I've just asked Is albedo ever greater than unity? How is it calculated for various surface diffusivities and specular reflection? to get at some of those subtleties. Not the answer you're looking for? Browse other questions tagged light magnitude albedo or ask your own question. Is albedo ever greater than unity? How is it calculated for various surface diffusivities and specular reflection? What is the difference between our time and space time? What is the apparent magnitude limit for the naked eye? How to calculate the limiting magnitude of Hubble? What is the brightest star (by absolute magnitude) that we can see by naked eye? What's the difference between apparent brightness and apparent magnitude? Are they the same? Why is Enceladus's albedo greater than 1?